Below is a list of lives saved by members of Troop 465. 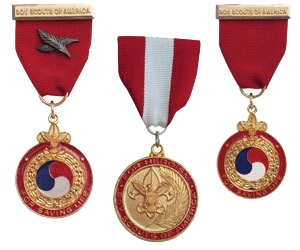 If you have any information about these deeds of heroism please email the webmaster, webmaster@troop 465.org. Here's a Fact Sheet about the various Lifesaving or Meritorious Action Awards, awarded by the Boy Scouts of America. While attending the Cherokee High School band camp, in Tiger, GA , and being in charge of the waterfront, he rescued 2 boys from their capsized canoe. One of the boys went under with Michael several times, but he was successful in saving both boys. When his sister ingested poison tablets, he administered first aid. He induced vomiting, and kept her awake on the way to R. T. Jones Hospital by holding her head out of the car window. Jerry received no medal, but did receive the Lewis H. Beck Medal for Lifesaving from the Atlanta Area Council. While with the Troop on the Etowah River, Louis rescued a boy who had jumped from a rope swing into the river without his life vest secured. Louie saved the boy while endangering himself. Louie received the Lewis H. Beck Medal for Lifesaving from the Atlanta Area Council and the Medal Of Heroism Award from the National Council. Administered CPR to a suicide attempt at Georgetown Shopping Center near Perimeter Mall. While in a shopping mall in Atlanta, Wes observed a man in a car slumped over the steering wheel. Checking on the man, he realized he was unconscious, and simultaneously gave the man mouth-to-mouth resuscitation and called 911. The man was awake and breathing when medics arrived. When his father severely cut his hand while using a power saw, Buckley stopped the bleeding and called 911. He received the Medal of Merit in 2000. Billy was instrumental in getting his father John necessary medical assistance. Billy received the National Certificate of Merit. Will and his father came home one night to hear screams and splashing in the lake behind their house. Two young adults had capsized their canoe and were flailing helplessly in the icy water. Without hesitation, Will grabbed his canoe and made his way to the lake while his father drove around to the other side. Will rowed out and towed the two people to the opposite shore, where Will and his father helped them get warm while the paramedics were on their way. When the paramedics arrived, they credited Will with saving the lives of both people, stating that had Will arrived even just a few minutes later, both victims would have perished. Will was awarded the Medal Of Heroism Award. Saved someone from choking at a Jamboree Troop meeting. Dominick was awarded the Medal of Merit. Administered CPR to a man who suffered a heart attack at a local restaurant. Nicholas was awarded the Medal of Merit. During Summer Camp 2017, these two Scouts showed an exceptional degree of character well above that expected of boys of their age and experience. The actions performed by these two Scouts were instrumental in, possibly, saving another Scout’s life and getting the Scout the help that he needed. Because of their thoughtfulness, quick thinking and positive action, they were awarded the Medal of Merit.